Donate at any Eschelon restaurant during the month of January and 100% of all funds added to your bill will go directly to HFHF! Eschelon Experiences dedicates four months of each year to give back to its core nonprofit partners. Eschelon asks its guests to come alongside their restaurants in supporting these vital causes by adding $1 (or more) to their bill which is then donated directly to its nonprofit partners. In 2014, this same campaign resulted in more than $8,000 for its nonprofit partners. Eschelon gladly supports HFHF’s vision for the future of Haiti. 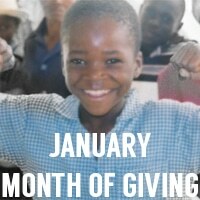 Month of Giving donations are an important step in bringing about lasting change in the lives of Haitian children and their families. Guests who dine at any one of Eschelon’s restaurants during the month of January will be able to add a donation to their bill, with 100% of donations going directly to HFHF’s Sponsor-A-Child program. Follow HFHF on Twitter, Facebook, and Instagram.